The Theresa May government, appointed after the defeat of the 'Remain' campaign has hinted it will trigger by March 2017 the European Union’s Lisbon Treaty Article 50, which foresees a two-year negotiation period between the two parties on the exiting process, as well as on the type of partnership they will have thereafter. One of the most important aspects of 'divorce' negotiations will be the future trade relationship between the UK and the EU. The key issue will be the free (without taxes, customs or other duties) access of the UK to the European Union single market of over 500 million consumers. 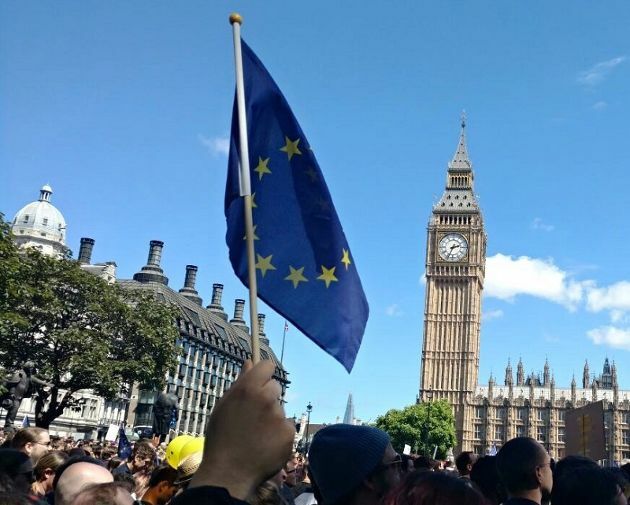 British government officials have declared a desire for the country to retain access to the single market, but this couldn’t come without the free movement of people and labour 'migration'; which the ‘Leave’ campaign promised to end. However, the volume of trade between the UK, the EU as a whole and the member-states individually appear to be so big that even if a free-trade agreement isn’t reached, it is fair to assume that both parties will put their effort into striking a deal that will preserve the importance of their trade relationships and the economic value generated from them. The graphs below explore who the winners and losers might be should trade relationships between the UK and the EU deteriorate after Britain exits from the EU. In addition, they indicate what the impact on the trade of Greece might be. Analysing data from the UK’s Office for National Statistics (extracted on November 25, 2016), the European Union as a whole appears to be the most important trade partner of the UK, far surpassing second-placed USA. Total trade volume between the EU and the UK exceeded 7,000 billion pounds during the period of 1999-2015, accounting for more than 51% of UK's total global trade. To paint the picture, the USA in the second place accounts for 13.6 of the UK's total global trade with almost 1,900 billion pounds. The EU is the number one exporting destination for the UK with over 3,200 billion pounds (close to 49%), as well as the biggest supplier of goods and services to the UK with imports close to 3,800 billion pounds (almost 53%). Equally important is the UK's bilateral trade with the European Union member-states. Seven of them (Germany, France, the Netherlands, Ireland, Spain, Belgium, Italy) are found among the top 10 trade partners, the top 10 exporting destinations as well as the top 10 suppliers of the UK, with a combined trade volume of over 5,700 billion pounds during the 1999-2015 period. All EU member states are above the 88th place among 192 countries and territories. Therefore, both the UK and the EU would have something to lose from a 'hard' Brexit that will leave no trade agreement with their biggest trade partners or lengthy negotiations that might result in an interim regime with barriers and charges on trade. Trade balance data, though, indicate that - with the EU exporting to the UK more than importing from it - the EU should display some urgency in trying to strike a favourable trade agreement. In the case of Greece, the data from the UK’s Office for National Statistics show that for the period of 1999-2015, Greece, among the UK's global trade partners, is 31st in trade volume (with over 87 billion pounds), 31st in imports from the UK (with over 38 billion pounds) and 30th in exports to the UK (with over 48 billion pounds). Again, the positive balance of exports versus imports should imply that Greece would be among the EU member-states to have a clear interest into pushing for a favourable trade deal with the UK in order to maintain the national income generated by exports to Britain. Using the Office for National Statistics data for 1999-2015 to plot an export volume versus export growth analysis, it can be extracted that trade-wise, Brexit doesn’t affect the European Union member states in the same way. Three groups of member-states with a lesser or a greater impact are being formed. The first is the group of member-states with low volume and low growth of exports going to the UK. Countries like Portugal, Denmark, Finland, Austria and Cyprus are in this group, which shouldn’t have that much to lose from tougher access to the British market as they don’t really show signs of a big increase in the rather low volumes of goods and services they are exporting to the UK. The second group is formed by countries with high growth rates of exports going to the UK, but with low volumes of total trade. Countries like Poland, Czech Republic, Romania, Luxembourg, Slovakia and Hungary belong to this group. The members of this second group would be more affected than the countries of the first group; as they’re growing exponentially the volumes of goods and services they are exporting to the UK, although the absolute numbers of these exports are on the same low levels with the member-states of the first group. There is no group of member states with high volumes and high growth of exports to the UK, therefore the ones that will be affected most are likely to be the ones with the biggest volumes of exports to the UK. They are the seven countries (Germany, France, the Netherlands, Ireland, Spain, Belgium, Italy) that are found in the top-10 of the UK’s biggest trade partners. These states might experience a significant impact on their trade performance and consequently parts of their economies, in case of long Brexit negotiations or sour EU-UK trade relations. They might have to shift their trade flows to other parts of the world or put pressure for a favourable trade agreement with the UK. Greece is among the group of member-states with low volumes and low growth of exports going to the UK. Among the 27 member-states of the EU, Greece scores 15th place in total volume of exports during 1999-2015, while 23rd place in compound annual growth rate of exports going to the UK (1.96%). The data from the Office for National Statistics show that for 1999-2015 most EU member-states are exporting to the UK more than importing from it. A harder access to the UK market and a stronger EUR vs. GBP rate might affect this positive balance. Only three countries (Malta, Luxembourg, Ireland) are importing from the UK more than exporting to it. For Ireland alone, imports accounting for more than 60 percent of its 666 billion pounds-worth of trade with the UK, thus leaving the country with a trade deficit of more than 134 billion pounds. For that group of countries a weaker GBP vs EUR rate might increase import flows, thus increasing their negative balance. On the other hand, a harder UK access to the European Union single market might help them to boost up their balance by reducing the volumes of their UK imports. Greece is among the member-states with a positive trade balance with the UK. For 1999-2015, the ratio of exports/imports has topped 56%/44% placing Greece above the European Union average, in the 15th place. Also, Greece has the 13th biggest trade surplus against the UK, with almost 10 billion pounds. Historical data like that showcased above are useful to understand the size of trade relationships between the UK, the EU and the EU member states. However, for a clearer picture of who will be the winners and losers in trade terms after Brexit, a 'snapshot' of the current situation is needed. In 2015, the EU was the UK’s biggest trade partner. with over 222 billion pounds of exports and almost 291 billion pounds of imports. The USA followed with over 100 billion pounds of exports and almost 61 billion pounds of imports. Germany, France, the Netherlands, Ireland, Spain, Belgium and Italy were again among the top-10 exporters, importers and trade partners of the UK. What varies though is the UK share of each country’s export mix. Combining data from two of Eurostat’s International Trade of Goods datasets (extracted on November 25th, 2016), light is shed on which EU member-states are currently most and least exposed to the UK market. Only Belgium, the Netherlands and Ireland send more than 8% of their exports to the UK, with the latter scoring close to triple the European Union average (13.88% to 5.73%). The rest of the UK’s ‘Big Seven’ trade partners send between 5% and 7% of their exports to Britain. They might also experience an impact on this performance and their economic gains should a harder access to the UK market follows Brexit. Greece ranks 21st in terms of export share going to the UK, with 4.26%. Britain currently accounts for a rather small share of total Greek exports, leaving the country with possibly a weaker motivation to give away much in order to secure a free trade agreement between the EU’s Single Market and the UK. The numbers in this analysis depict the complexity of the trade relationships between the EU, its member states and Britain, but what they haven’t focused on the rest of the problems Britain may have to face if leaving the single market; for example negotiating separate trade agreements with the countries and trade blocs the EU already maintains trade agreements with. The UK might keep contributing to the EU budget for access to the single market, but analysts expect even more than 10 years will pass before a final trade deal being signed between the two counterparts, with the risk of lengthy negotiations leaving UK trade to revert back to WTO rules looming as well. *Demetrios is a business and tech journalist from Athens. For the last 4 years he has been covering startups, venture capital and digital economy. His work on business, tech and data has appeared on The Huffington Post Greece, The Global Post, Fortune Greece, Berlin Valley Magazine, The Hundert and more. Follow Demetrios on LinkedIn or Twitter.